The diamond Jubilee of De Beers Consolidated Mines passed off quietly in 1948, the massive post-WWII growth and expansion of the diamond industry had barely begun, while several important sources of diamonds, including the Premier Mine, were still closed, while others remained to be discovered. Forty years later the annual output of diamonds exceeded 100 million carats and sales of rough diamonds reached around $5 billion. On March 11th, 1988, the centenary celebrations of De Beers took place in Kimberly and a banquet was held to close the Kimberly Mine (aka the "Big Hole"). An audience of four hundred people, including representatives of several national governments of diamond-producing countries and dignitaries from various sections of the industry, listened to the welcoming speech of the chairman, Julian Oglivie Thompson, totally unprepared for his final sentence: "We have recovered at the Premier Mine a diamond of 599 carats which is perfect in color - indeed it is one of the largest top-color diamonds ever found. Naturally it will be called the Centenary Diamond." The Centenary, appearing to be lit by multi-colored lights. No more fitting way of celebrating 100 years of achievement by De Beers could have been devise than the discovery of such a diamond and nowhere was it more likely to have been recovered than at the Premier Mine. Over the years this extraordinary mine has produced several outstanding diamonds of the most superb color, which have been cut into famous gems: The Cullinan in 1905; the Niarchos in 1954; the Taylor-Burton in 1966 and the Premier Rose in 1978. Now that the second millennium has ended, it is interesting to reflect that only nineteen gem-quality diamonds larger than the Centenary rough have been found during its course. The Premier Mine itself has produced nearly three hundred stones weighing more than 100 carats, and a quarter of the world's diamonds weighing more than 400 carats. The Centenary was found on July 17th, 1986 by the electric X-ray recovery system at the Premier Mine. Only a handful of people knew about it and all were sworn to silence. In its rough form it resembled an irregular matchbox with angular planes, a prominent elongated "horn" jutting out at one corner and a deep concave on the largest flat surface. The shape of the stone expressed problems in cutting with no apparent solution. The man chosen to evaluate the Centenary was Gabi Tolkowsky, famed in the diamond industry as one of the most accomplished cutters in the world. His family had long been in the diamond trade and it was his great-uncle, Marcel Tolkowsky, diamond expert and mathmetician, who published a book in 1919 titled "Diamond Design", which for the first time set out exact ways of cutting the modern round brilliant cut. Gabi Tolkowsky himself was the creator of five new diamond cuts, revealed in 1988, which concentrate on maximizing brilliance, color or yield - or a combination of all three from off-color rough diamonds previously thought difficult to cut profitably into conventional round or fancy shapes. Named for flowers, the cuts are largely based on unorthodox angle dimensions. The overall proportions as well as the use of more facets around the pavilion increase brilliance and improve visual impact when viewed face-up. Gabi Tolkowsky examines the Centenary with a jeweler's loupe. When he first saw the Centenary, Tolkowsky was astounded by its exceptional purity. "Usually you have to look into a diamond to appreciate its color, but this just expressed itself from its surface. That is very rare," Tolkowsky said. He knew the protruding "horn" would have to be removed as well as other "asperities," as he called them, which interfered with the stone's basic shape. At the same time, Tolkowsky realized that the diamond would be difficult to polish because its shape did not offer an obvious approach. Usually a diamond will suggest two or three shapes to its cutter but the Centenary was more generous - if more baffling - by providing several possibilities. In the end Tolkowsky submitted his appraisal, saying that the diamond must be kept intact to produce one singe large modern-cut diamond. 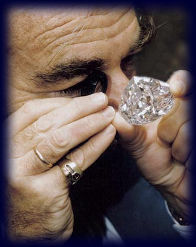 He was asked to cut the Centenary, and late in 1988 Tolkowsky, two master cutters - Geoff Woolett and Jim Nash - together with a handpicked group of engineers, electricians and security guards set to work in a specially designed underground room in the De Beers Diamond Research Laboratory in Johannesburg, South Africa. It was crucial that the room, like the special tools needed for faceting, should be stable and strong; nothing must rattle, everything must be tight, there should be no mechanical vibration or variation in temperature around the cutting table. For one whole year while the right tools and technical conditions were created, the Centenary remained unaltered and untouched. Tolkowsky examined the stone until he knew every fissure and crevice of it. Using the most sophisticated electronic instruments he gazed deep into the crystal structure. "From the moment I knew I was going to cut it," he said, "I became another man. A strange man. I was looking at the stone in the day, and the stone was looking at me at night." A picture of the Centenary in the hand of some unknown hand model. Another good photo to show scale. The first step before the diamond could be faceted was the elimination of large cracks from the edge of the stone running a considerable depth inside it. He decided not to saw or cut with a laser because both methods would heat or vibrate the diamond. Instead, he turned to the time-honored method of kerfing by hand. 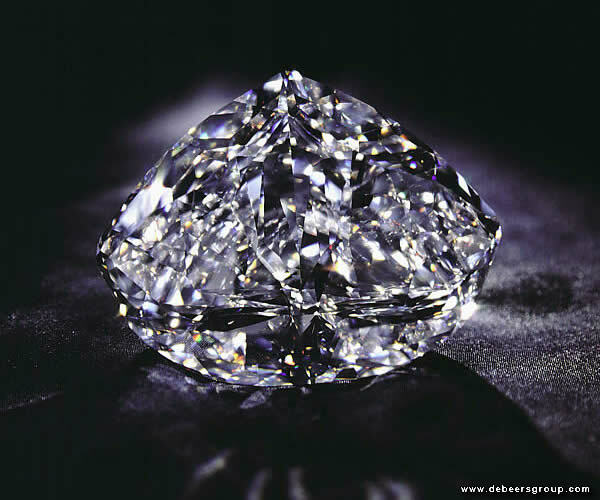 It took Tolkowsky 154 days to remove about 50 carats which otherwise would have been polished to dust. At the end was a roughly-shaped rounded crystal about the size of a bantam's egg, weighing about 520 carats. After that was an endless process of drawing and measuring as possible shape designs began to emerge. In all, thirteen different designs were presented to the De Beers board, with the strong recommendation they should chose a modified heart shape. Once this recommendation had been accepted, the final process of faceting the Centenary began in March, 1990. By January, 1991 it was nearing completion. 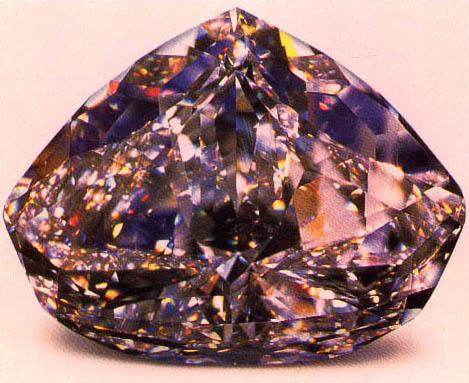 When cutting was completed the Centenary weighed 273.85 carats, measured 39.90 × 50.50 × 24.55 mm, and had 247 facets - 164 on the stone and 83 around its girdle. Never before had such a high number of facets been polished onto a diamond. In addition, two flawless pear shapes weighing 1.47 and 1.14 carats were cut from the rough. Amoung top-color diamonds the Centenary is surpassed only by the Cullinan I (aka the Star of Africa) and the Cullinan II, which were cut from the Cullinan crystal before modern symmetrical cuts were fully developed in the 1920's, making the Centenary the largest modern fancy cut diamond in the world and the only one to combine the oldest methods - such as kerfing - with the most sophisticated modern technology in cutting. The Cullinan diamonds are actually near-colorless, but qualify as white diamonds. The GIA color grading letters D, E and F qualify as colorless, and the Centenary is the best of the three - a 'D'. This spectacular gem, which has become the ultimate example of those qualities was shown to the world for the first time in May, 1991. Mr. Nicholas Oppenheimer, then Deputy Chairman of De Beers rightly declared "Who can put a price on such a stone?" confirming that it was insured for around $100 million. Whether the Centenary Diamond has since been sold is a mystery. The De Beers Group's policy is not to dislose such information so that the anonymity of its clients is protected. Some day the Centenary will probably resurface, perhaps at auction, or in a museum display housing some country's crown jewels. Gabi Tolkowsky has since cut another large gem of note, the Pink Sun Rise, a 29-carat pink diamond with a facet pattern similar to the Centenary's. Also cut the largest faceted diamond in the world - the Golden Jubilee. Sources: Famous Diamonds by Ian Balfour, The Nature of Diamonds by George E. Harlow, and the De Beers website. In the autumn of 2001, I found Gabi Tolkowsky's mailing address on the internet, and decided to write to him. He lives in Antwerp, Belgium, which comes as no surprise as as this is the diamond cutting capitol of the world. Among the questions I asked him was whether he had heard about the Centenary Diamond selling or not. In his reply he told me he had heard the rumor, but no one had confirmed it to him.